TEN Different Online Fossil Catalogs! 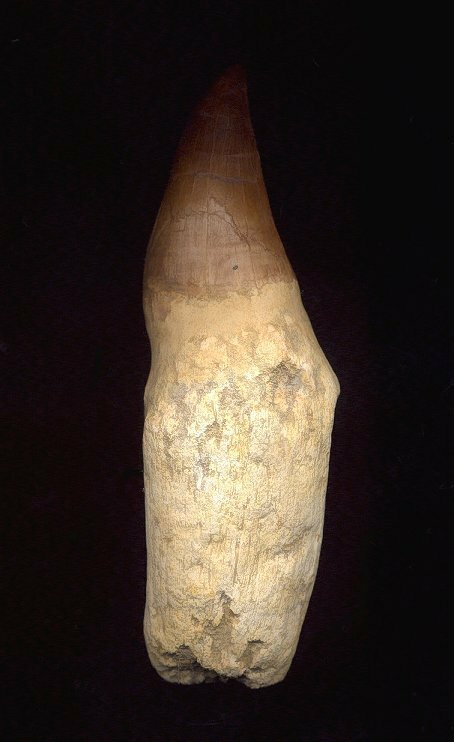 This is an excellent example of a Mosasaur tooth. It is a large Mosasaurus anceps tooth from the Cretaceous of Morocco. This specimen was recently acquired from a major fossil collection. The tooth is free of matrix and complete, with the huge root still fully intact. The pointed tip of the tooth is also complete, which is extremely rare. The reddish-brown enamel is beautifully preserved, and the root is robust and extremely 3-dimensional. This is a very collectible tooth from a huge, dinosaur-like aquatic reptile.